As their title belies, nothing is straightforward when unconventional hydrocarbons are concerned, especially when it comes to estimating reserves. Between shale oil and gas, coal bed methane, methane hydrates and deep and ultra deep water oil sources, the potential of unconventional hydrocarbons to fulfil humanity's energy needs far outreaches that of conventionally exploited fossil fuels. 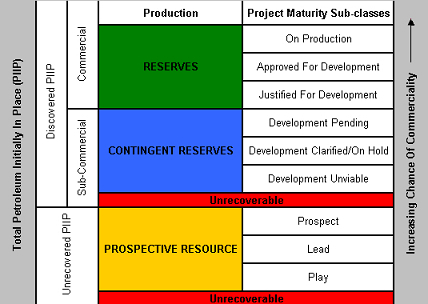 The diagram below from the Society of Petroleum Engineers' Petroleum Resources Management System (PRMS) 2007shows the different gradations a potential resource must pass through to be classified as a commercially viable producing reserve. Unconventional hydrocarbons will follow the same steps of categorisation, but going from "play" to "reserve" is often more challenging given the nature of the reserves in question. One element of the equation is that the methods currently used to detect and measure fossil fuel reserves simply are not designed for use in the unconventionals arena. Using shale gas as an example, some stretches of identified unconventional gas reservoirs may not be registered as commercially viable using state of the art seismic techniques. By the same token, reservoir quality, rock properties and hydrocarbon fluid type are also variables that may not be adequately assessed by extant technologies, thus leading to the possible underestimation of reserves. Deep and ultra deep water reserves like the Santos Basin's Tupi, Jupiter and Sugar Loaf fields are somewhat easier to qualify than their unconventional counterparts, while those that estimate oceanic methane hydrate reserves at more than twice the global reserves of all conventional gas, oil, and coal deposits combined are indulging in what could be classified as informed speculation. With depleting easily exploitable hydrocarbon sources diminishing across the globe and the spectreof peak oil looming, the focus on unconventional reserves is greater than ever before, but technologies to aid their estimation are in drastic need of keeping up with growing interest.